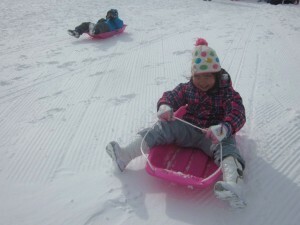 On Friday, February 10th, St. Paul’s Kindergarten had another outing. 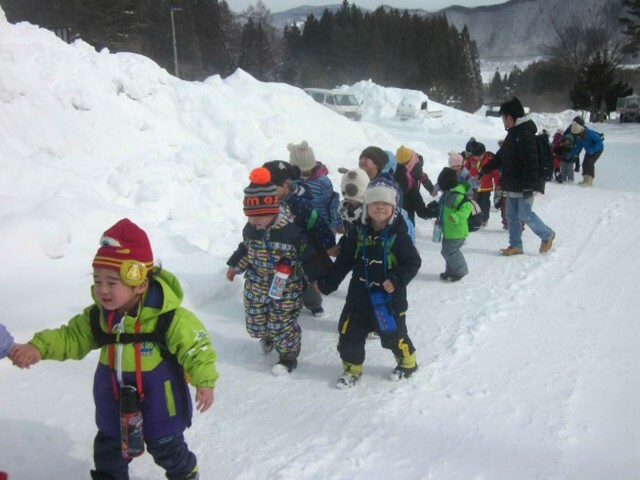 A large bus took the kids and teachers to “Family Snow Park Bandai x 2,” a park for nature exploration and athletic activities located in the town of Inawashiro, Fukushima. This Friday was blessed with a fresh snow fall. 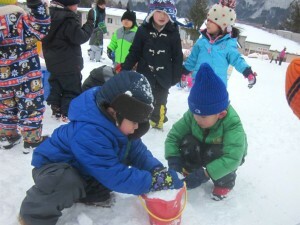 The kids’ homes are in Koriyama, where it had snowed some before they got on the bus. When they got off the bus at the park, they were surprised by the very heavy snow cover. However, tons of snow could not discourage them from walking to the slope with vigor and joy! “Wow, the slope is almost here!” The kids dashed through the glorious white. 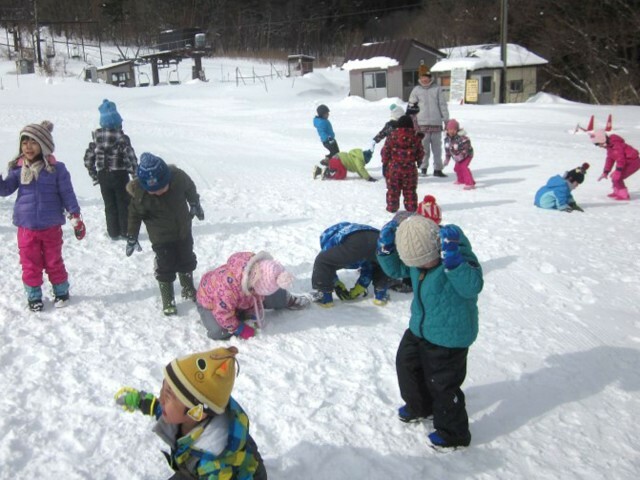 Some tried sitting on the snow, while others tried lying down on it, but the snow was so cold some started crying. 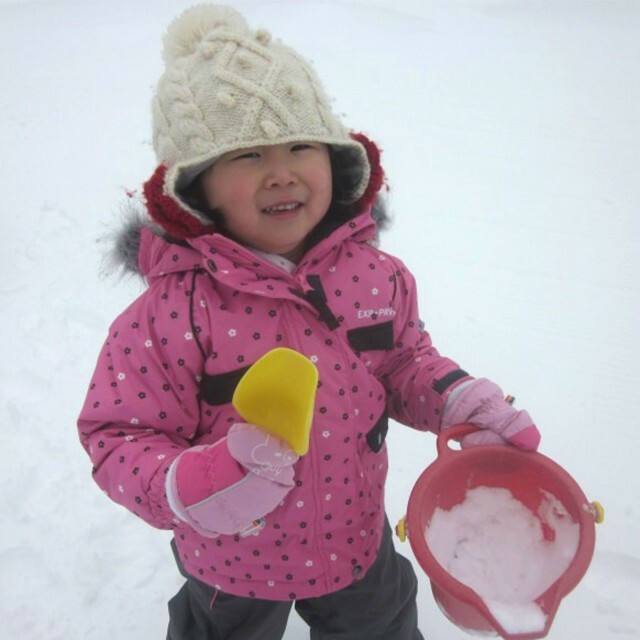 “This is not sand.” “Wanna make a cake of snow?” Time stopped for them as they played in the snow. 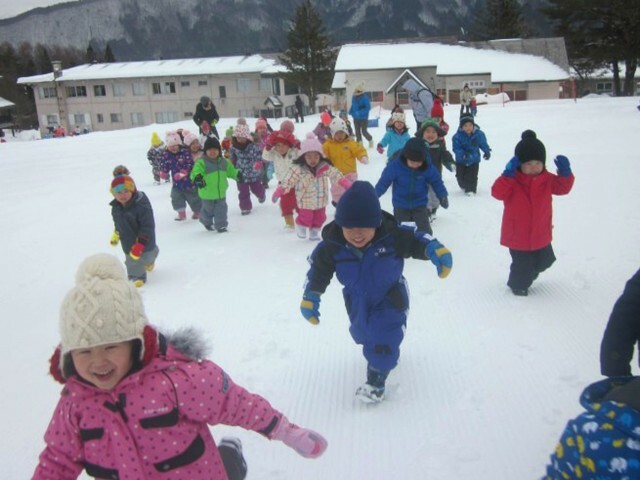 The kids were told to “Use your feet as the brake to stop the snow sled,” but for this kid the brake did not work well, and a teacher down the slope had to catch the kid. Rev. Naoto Iwasa and Ms. Minako Sakihara, a teacher, who came all the way from subtropical Okinawa, joined the snow fun tour to help the teachers. The two were shocked to see how deep the snow cover was. The kids wrote, and gave them, letters of thanks. On January 31st, 2017, at “Wakuwaku Hiroba” (“Hustle Square”) at St. Paul’s Kindergarten, the No Nuke Project held “Yoga and Massage for Mothers and Babies,” targeted at one-year-olds. The instructor was Ms. Yoshie Hatakeyama. First, each mother sat on the floor and held her baby on her lap. As the instructor sang a song, each mother “rocked” her baby, moving forward and then backward, or sometimes standing up with the baby in her arms. Both the mothers and the babies seemed very happy as they relaxed together. Then they enjoyed playing with colorful cloths. To conclude, the mothers listened to Yoshie’s stories, drawn from her own child raising experience, and they asked her questions while they enjoyed herbal tea blended by the instructor. The mothers and their babies all had a very relaxing time. One thing to keep in mind during winter on the Pacific side of Japan: the atmosphere is very dry. So, it is a good idea to apply a moisturizer to the skin after a shower. This will help prevent skin allergies. Every childcare story Yoshie told revealed her deep affection for kids, and was very helpful and practical to the mothers. I, Izumi Koshiyama, experienced child raising many years ago, yet the yoga and massage were a delight to me as well.